In a nutshell, affiliate marketing is when a third party sells one of your products or services for you to their audience and earns a commission on the successful sale. Sounds simple doesn’t it? But actually it’s a radical change in the traditional marketing model. In traditional marketing the lead generation processes remains very different. Essentially, the business owner speculates to accumulate. In other words after some market research the business owner invests a sum of money up front in the expectation, or, more often than not, “hope” that this investment will turn into a profit sometime in the future. They invests £50 today in the hope that it will turn into a £100 profit in the future. Does that sound like your marketing model? The beauty of partnership affiliate marketing is it’s the other way round. This business owner (often referred to as the “merchant”) makes her products and services available to the affiliate marketer to sell to their audience. The affiliate marketer makes a sale and their customer pays the merchant direct. As a thank you for the business that they would not otherwise have received, the merchant pays a commission to the affiliate marketer for the sale. This commission is usually a percentage of the sales price still leaving a healthy profit for the merchant. So now the business owner pays the affiliate marketer £5 AFTER they have already made and received the £10 sale from this affiliate’s customer. The financial risks to the business owner are minimised if not completely eradicated. They suddenly have a commission-only sales force, which they only pay after the sale has been made and the money received in their bank account. Who wouldn’t want this affiliate marketing model as a part of their business? Of course, this way of marketing demands a new set of skills and responsibilities from the business owner to really capitalise on this amazing and cash flow positive opportunity. As entrepreneurs, the affiliate marketer will look for the biggest return on investment and will select the businesses that offer the largest opportunity to generate a healthy profit. This means business owners are competing with each other to make their business and their affiliate programme the most appealing for the affiliate marketer to choose. They need to offer an amazing product or service (obviously! ), be easy to work with, offer great marketing support and enable the affiliate to make a decent profit for their hard work. So, one of the biggest challenges that businesses face today is how to attract, motivate and keep really good affiliate marketers that will keep those profitable sales coming in. Amazon are a great example of an organisation that understood this concept way back in 1996. There’s a good reason that they soon attracted over one million affiliate marketers on what they call their Amazon Associate Programme. They established a simple, easy to follow affiliate marketing programme that enabled third parties to choose a range of goods that would appeal to their audience. They provided a framework to make it easy to share that information with the affiliates’ audiences and, most importantly, delivered on their promises to the end customer. Most people’s perception is that buying something “on Amazon” is practically risk free. If it doesn’t get delivered, you’ll get your money back. If it’s damaged, you’ll get a replacement or your money back. For a little extra cash, they offer next day delivery on a huge number of items and for many people they are the first port of call when shopping online. In short, they have established an amazing BRAND by what they actually DO, not by what they say they will do. This is extremely attractive to affiliate marketers as they know they can rely on Amazon to deliver on the promises that the affiliate will make to their own audience. They also have a commission structure that enables the affiliate to make good money. Whilst there might well be bigger opportunities for the affiliate with some niche companies, there is no better starting place for the new affiliate to set up their business than by signing up to Amazon’s Associate marketing programme and learn the basics by simply getting going! Reputation is hard earned by great value and consistent delivery and your REPUTATION is EVERYTHING in successful Affiliate Marketing Partnerships. “Word of mouth” marketing is still one of the most powerful and strongest influences on decision making and is being fuelled everyday by the growth and ease of social media. Looking up a business via a Google search and then reviewing website may give a view of how the business wants to be perceived, but what the consumer wants to know is what do their customers think of them? Who books a new hotel or restaurant without checking out the latest TripAdvisor reviews first? TripAdvisor and other review sites have very cleverly identified a key trend in consumer behaviour that because purchasers want feedback from other purchasers before they buy, they are also willing to share their own experiences online to encourage others to do the same. As I indicated above, all social media platforms are filled to the brim with information from the general public about goods and services that they have purchased and about their experiences with suppliers – good, bad, and downright ugly. Social media is fuelling a basic human instinct to be influenced by other people’s opinions before making a purchasing decision and so it is absolutely essential that the business owner ensures their BRAND (what they actually do in the real world) makes them hugely attractive to affiliate marketers. Pop over and join me in my private Facebook group ‘Partnership Profits’ where I share step-by-step guides, video training and Live Q&A sessions all around ‘How To Develop A Top Notch Affiliate Marketing Programme’ that will ensure you stand out from the crowd. I regularly share insights into the life cycle of the affiliate relationship and how to keep them both on board and excited about selling your products for you over time. I also share how best to help your affiliates and make their life easier, and how to keep track of what you are actually doing in tangible terms so you can replicate the techniques that worked well and ditch the less successful initiatives. STOP paying for leads and START paying for actual sales. 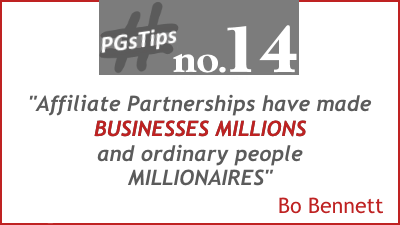 Affiliate Partnerships is my go-to business growth strategy for any business I start or invest in. With so many start-up businesses failing because of poor cash flow and more established business struggling for sustainable growth as competition increases there’s huge potential for every business is implement Affiliate Partnerships as a new marketing channel and make the shift from ‘Paying for Leads’ over to ‘Paying for Results’ as the affiliate commissions are only paid AFTER the sales transaction is complete. In my opinion it makes good financial sense for every single business to develop a really attractive affiliate marketing programme. Pop over and join my Facebook Group ‘Partnership Profits’ and this is what I’ll help you achieve.